Advance your chemistry, materials scientists, and engineering research with the Amsterdam Modeling Suite. Easy to employ yet powerful computational chemistry tools, with support from our experts. Whether you research organic electronics, chemical reactions, or (nano)materials, we have the right tools for you. The Amsterdam Modeling Suite offers DFT, semi-empirical, reactive force fields and fluid thermodynamics all with an integrated GUI, a powerful AMS driver and python scripting tool PLAMS. The SCM team is passionate about making computational chemistry work for you. Smooth installation from a single binary on Windows, Mac or Linux means you can get start immediately with advancing your research! Enjoy expert technical support from our developers, also during your evaluation. The passionate scientists at SCM are committed to make computational chemistry work for you. 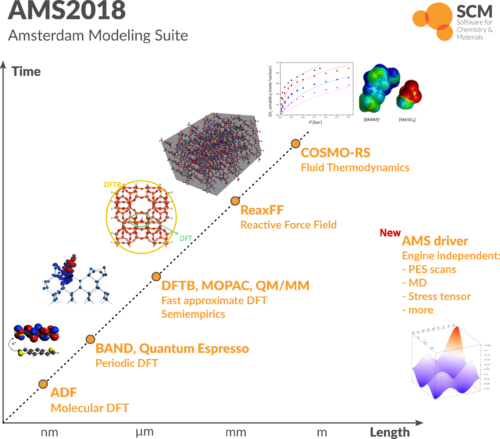 The Amsterdam Modeling Suite offers an easy integrated graphical interface to all our powerful computational chemistry engines, ranging from DFT to DFTB to reactive MD and fluid thermodynamics. Whether you are an enthusiastic computational chemistry teacher, an academic scrutinizing the intricacies of chemical bonding, or an industrial researcher designing the next OLED materials, we have the tools for you. Browse our different compute engines, have a look at the scientific publications citing ADF, or see specific capabilities per research area. Or reach out to us to discuss your research challenge! We strongly encourage you to try out our software to experience how easy & powerful the Amsterdam Modeling Suite is. And do let us know which research you are working on, so you can make the most out of your evaluation! AMS license fees depend on a number of factors, including which computational engines you want to use and on how many CPU cores (see pricing tables or request a price quote). For the manuals and tutorials of the AMS driver, our compute engines, and the integrated GUI, click the links below.